Hazardous Level: Carpenter Ants can carry diseases and germs. Generally they won't cause illness to humans, but the potential is there. Multiplication Level: An average colony contains 2000 to 3000 ants. Recognize a Carpenter Ants. Measure 3 to 12mm (1/8” to 1/4” ) Colour is either black or black with red, Antennae are elbowed and they have large heads with strong mandibles (jaws) used for chewing. Reproductive forms are winged. 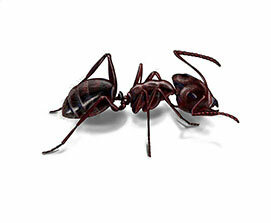 The most effective way to get ride of ants is to spray the foundation around windows and doors this will put up a barrier to prevent ants and other insects (earwigs, spiders, sow bugs, flys, centipedes, bees) from entering your home. The second part of treatment is to properly bait the inside of home in all effected areas spraying the inside can result in spreading the ants to other parts of your house these are called satellite colonies. Trying to deal with a ant problem improperly can result in a more serious infestation. For further information about the Anypest way for ant removal please have a look at our Southern Ontario Ant Identification guide. Yes carpenter Ants can carry diseases and germs from one area to another. Carpenter Ants are social insects that live in colonies. Winged reproductive Carpenter Ants are not produced until the colony is well established. After mating the winged reproductives leave the colony to establish new ones. An average colony contains 2,000 to 3,000 ants. How can I tell if I have a Carpenter Ant infestation? The presence of worker ants in your home is the first sign of an infestation. The presence of chewed wood similar to saw dust (called frass) is an indication of an active nest. Any insect found in the home is cause for concern. It is recommended that you seek the services of a trained Pest Control professional to eliminate pests for through results. How do I keep Ants out of my Home? Ants are like anything else, in that they require food, water and shelter. Keeping food ant proof is a simple way to start with eliminating ants. For example, put cereal in airtight containers (as ants like getting into cereals with dry fruit such as Raisin Bran) Pick up any food scraps off the floor and clean crumbs off of counter tops. This entry was posted in Pests on 2013/08/21 by Any Pest.